Google is set to abolish its longstanding ban on real-money gambling apps at its Android Google Play app store, provided operators are licensed in the countries they are targeting. 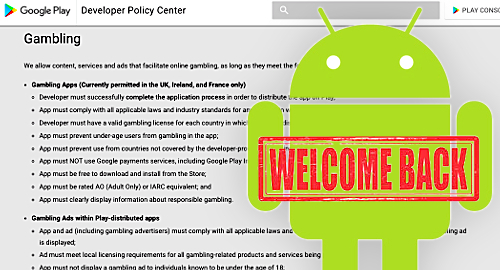 The apps will initially be available only for users in the UK, France and Ireland from the beginning of August, but may be rolled out into other jurisdictions where online gambling is legal “at a later date,” according to Google. 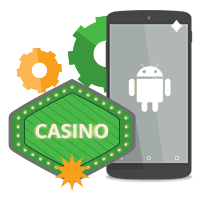 While it has always been possible to gamble on Android devices, users would not find them in the Android marketplace. Instead, they would have to visit an online gambling site directly and download the app at the source, or find it through a third-party app. This restricted the operator’s route to market and ability to use the Play Store as a direct acquisition tool. 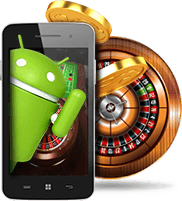 Android owns around 50 percent of the smart phone market, which means the new rules will open up a vast customer acquisition channel for online gambling operators. Gambling ads and branded free-to-play apps were previously permitted on Google Play, as long as developers were compliant with local laws and Google’s own regulations, which included not targeting underage users and including responsible gambling messages on their ads. Google implemented the real-money app ban in 2013 because of difficulties verifying the age of users of its devices, and because serving a global market with widely differing gambling laws in each jurisdiction provided it with a legal headache. But the tech giant appears to have overcome these qualms. This week it emailed gambling firms and app developers advising them of the new rules. One recipient was Andrew Daniels, managing director of UK based tech company Degree 53, whose clients include BetFred and 888 holdings. There was a suggestion as early as September 2015 that Google’s attitude was changing when, on the eve of that year’s NFL season, it quietly allowed daily fantasy sports site DraftKings’ and FanDuel’s real-money apps into the Play Store.